To be a Technology Leader, delivering to our customers a High Quality of Product and Service. This will be achieved through constant Innovation of all products and processes making us a natural first choice to our customers. We will constantly strive to increase Shareholder Value and Stakeholder Value by improved performance and being responsible social and environmental citizens. IP Rings is a front line automotive components manufacturer, specializing in the production of piston rings in high carbon high alloy steels and nodular iron with a variety of surface coatings that find application in present day high performance low emission engines. It also produces a series of transmission parts and other components for automotive and related industries employing a unique Precision Forging technology. IP Rings has gained wide acceptance among OEMs and in the Aftermarket and is rated as a progressive forward looking technology driven company. IP Rings came into being in the year 1991 as a joint venture promoted by India Pistons Ltd, Simpson & Company Limited, Tractor and Fram Equipment Ltd.and Amalgamations Private Ltd in Technical and Financial collaboration with Nippon Piston Ring Co. Ltd of Japan, a world leader in the manufacture of piston rings. IP Rings as well as the promoter companies are all members of the Amalgamations Group, a large conglomerate of engineering and non engineering companies with a commanding presence in Farm Mechanisation, automotive components, Parts distribution and allied engineering fields. The Group also has a significant presence in non engineering enterprises like tea plantations etc. Amalgamations is the result of the vision its illustrious founder Sri. S. Anantharamakrishnan had of India as an industrial giant and a great economic power and his resolve to be a part of this transformation. 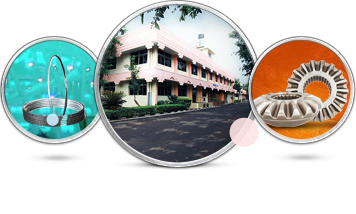 India Pistons Ltd; a promoter company of IP Rings was launched in 1949 and specializes in the manufacture of Pistons, Piston Pins, Cylinder Liners and Standard and Alloyed Cast Iron Piston Rings. Nippon Piston Rings; Japan is a technology leader having a vast experience in the manufacture of Piston Rings, Cylinder Liners, Valve Seat Inserts, Camshafts and other key IC Engine related components. IP Rings with its in house capability of a large variety of surface coating technologies, design capability and strategic partnerships specifically with the above two companies is able to cater to the most advanced Cylinder System Requirements. Similarly; for its Precision Forging Division; a license agreement with MIBA of Austria for specialty linings and Schmid of Switzerland for its Unique Precision Forging Technology gives the company the capability to manufacture cost effectively and efficiently several complex precision parts needed by todays customers. The company is located 50 Km’s from Chennai in Maraimalai Nagar. The facility has several “State of the Art” Manufacturing Facilities in both its Piston Ring and Precision Forging Divisions. Professional Management, adoption of global practices in all spheres of activity and a relentless pursuit of quality, continuous investment in assets and people for excellence have earned for the company recognition and respect from OEMs and in the Aftermarket. The company has in place systems conforming to TS and ISO standards relevant to the industry and have received accreditation. Today the company is supplying world class products to Tier-1 and Tier-2 OEMs as well as to the Aftermarket and is exploring new domestic market segments and targeting global exports as a major growth area. The company now rests on a firm operational and financial base and is poised for exponential growth in the coming years.